You know what makes the world go round? Food. 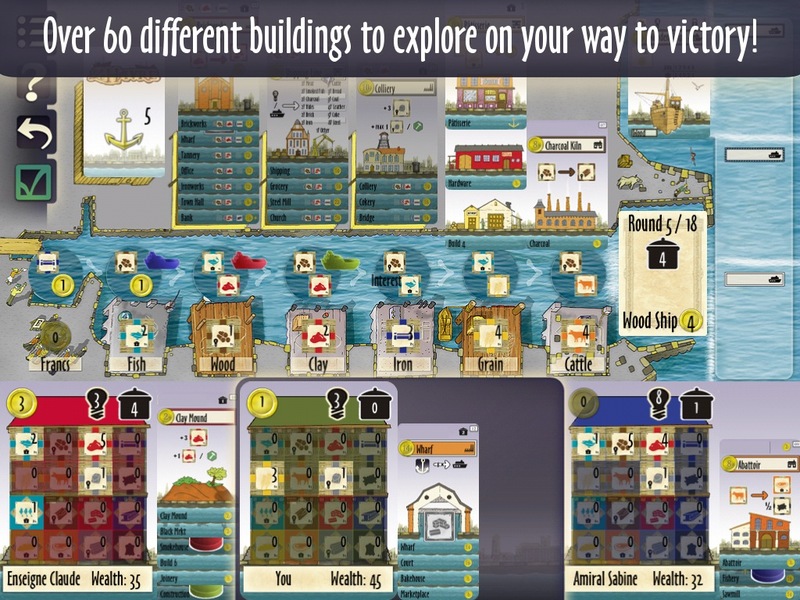 Especially in the town of Le Havre ($4.99). You can have all the Francs you want but if you can’t feed your workers, you’re going to be in a world of pain. After all, hungry men don’t make money, they make medical bills. A fantastically down-to-earth sort of game, Le Havre is yet another nifty iOS port of a well-loved board game. The objective here is simple: you want to become the wealthiest man alive. Well, more or less, at any rate. You really just need to beat your opponents in the profitability department. In order to accomplish this lofty goal, you’re going to have to gather resources, manage buildings, finance construction, provide life-giving sustenance to your minions, build ships and make life as difficult as possible for your fellow capitalists. It’s both simpler and more complex than it sounds. Each round comprises of eight turns. During the first seven turns, you’re going to have to decide between picking up one of the offers on the board (the offers basically consist of the seven types of resources in the game. Each turn, the offers will increase slowly in value.) or the usage of a building. This, in comparison to the former, is a somewhat more complicated affair. When you talk about ‘using a building’ in Le Havre, it can mean anything from a visit to the abattoir (your squealing cattle will not transform into delectable t-bone steaks themselves) to an excursion to the wharf so as to be able to build a new ship. On the eighth turn, harvest time takes place and you’ll be called upon to feed your workers. Once that’s done and dealt with, the new round will begin. 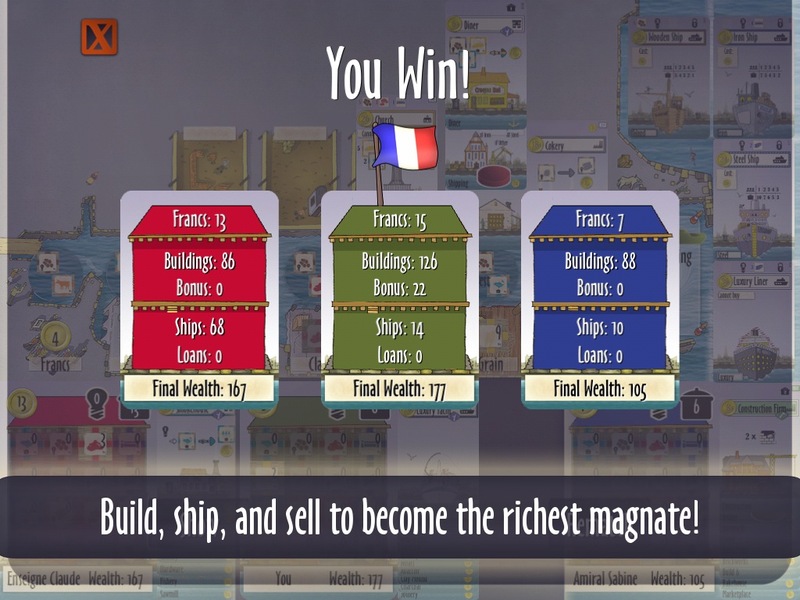 And that’s one of the things that makes Le Havre so incredibly engrossing; it’s not a game that you’re going to master in a day. It’s not a game that you’re going to be able to master in a week. More often than not, you’re going to find yourself pleasantly befuddled as a novice. However, what saves it from being frustrating is the fact that everything is rather streamlined. There are no fancy swipes here. In order to do anything in the game, you simply need to tap once. That’s it. information will always be at your disposal. The help files exist in abundance and are easily accessible. Even the tutorial system is refreshingly, well, informative. Le Havre is a game that is not shy about holding your hand or coughing all over the necessary tools. The only thing it won’t do for you is help you to win. In terms of its audiovisual delivery, Le Havre is neither extremely impressive nor atrocious. Both the graphics and the music do enough. No more, no less. Then again, appearances aren’t what compels us to play board games, right? Seriously, though, if you’re a fan of board games, you kinda owe it to yourself to pick this one up. I’m usually adverse to the idea of playing a board game on my iPhone but this actually went swimmingly well. It’s a solid package and one that will keep your inner entrepreneur happy for hours on end.